After applying for re-election to the League for five successive seasons, then finishing bottom in 1960, and next to bottom in 1961, things could only improve. In 1962, the class of the opposition was obvious with Bacup and Roy Gilchrist, Accrington and Wes Hall, Nelson and Johnny Wardle, Rawtenstall and Chandu Borde, Lowerhouse and Basil Butcher, and Ramsbottom and Seymour Nurse. Church had West Indian fast bowler, Chester Watson, as the paid man. With Watson firing on all cylinders, Church set off like the proverbial house on fire and lost only once before June 30. In what was a season much affected by bad weather, Watson announced his intentions on April 14 when, chasing a Church total of 133, Nelson were dismissed for 83 with Watson taking 7-32. This was repeated two weeks later when Bacup were bowled out for 44 with Watson taking 5-15. Next were Lowerhouse, dismissed for 94 (Watson 6-31 with five clean bowled). Watson was well supported by Alan Bourke as demonstrated against Rishton with the professional taking 5-27 and the amatuer 4-28. Church lost at Haslingden, falling to Ikram Elahi who took 8-35. However, they were back to form in the following game, bowling out Haslingden for 88 chasing Church's 95 (Watson 6-41). Todmorden were next, dismissed for 31 (Watson 7-10 off 6.5 overs). Next was Rishton for 59 with Watson taking a hat trick, and Bourke returning 3-29. Church drew with East Lancashire in before a crowd reported to be 2,500. A disputed decision for caught behind set Watson alight and the match saw possibly the most hostile bowling at the West End in a generation. It also probably lit the touch paper for the problems which re-ignited in the away fixture some time later. The weather was a continual problem, contributing to four successive draws befor Colne were beaten, dismissed for 100 (Watson 5-39, Riding 53). In the return at East Lanacshire, Watson, for the only time, 'lost his rag'. With Church 170-9 declared, East Lancashire, after a disastrous start at 16-5, recovered to 159-7. Watson's aggression during this spell angered the spectators, and he eventually retaliated by bowling underarm in his frustration. Church were beaten by Malcolm Hilton's Burnley, then bowled out Rawtenstall for 96 (Watson 8-42, 54). Then it was Enfield for 67 (Watson 7-26), and Rawtenstall again for 62 (Watson 5-26, Bourke 4-19) chasing 74. Accrington went for 84 (Watson 6-43, Bourke 4-40, Riding 52 not out). Church then lost at home to Burnley despite Watson's 93 and 5-63. Colne were bowled out for 115 (Riding 5-30, Bourke 5-55). 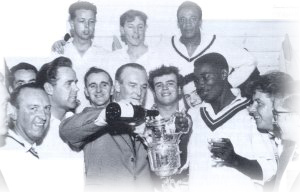 On September 1, at home to Ramsbottom, Watson took 7-20 to dismiss the visitors for 48, and win the Championship for the first time since 1945. Watson finished top of the League bowling averages with 117 wickets at 7.58. Alan Bourke took 61 wickets in all games, and the Church batting had also been consistent with six men scoring over 300 runs.